Sweetleaf is opening a third location in LIC at 28-10 Jackson Avenue, the new Tishman Speyer building. LIC Flea’s First Day of Business – Success! Last week we learned that LIC coffee pioneer Sweetleaf is opening their third location in LIC (fourth overall if you include their location in Greenpoint) in a new building from Tishman Speyer. This building is actually one of three on the property footprint, at addresses 28-34 Jackson Avenue, 28-10 Jackson Avenue and 30-02 Queens Boulevard. The LIC Court Square blog reminds us that its moniker is “Jackson Park” (and has a good shot of the coming soon Sweetleaf signage). 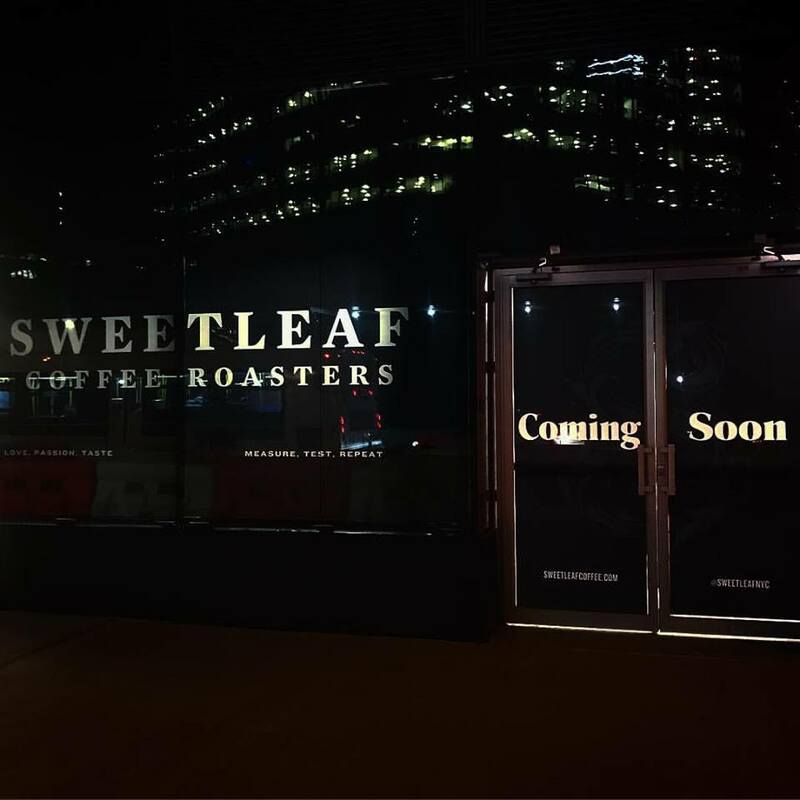 Anyway, Sweetleaf posted a picture of the “Coming Soon” signage on Facebook and Instagram. The plan right now is to open in late winter/early spring of 2018 and it will be at the 28-10 Jackson Avenue address. 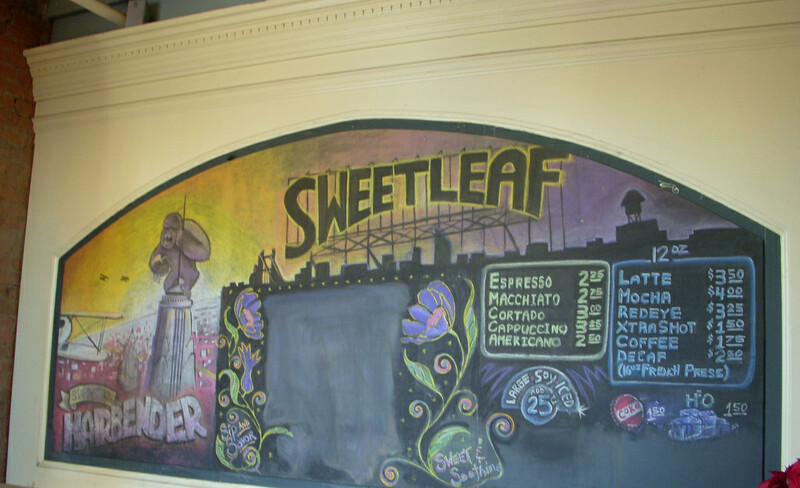 Throwback to this cool menu mural at the original Sweetleaf, taken in 2009. That’s good with me because they make some of the best coffee in LIC and have for many years—every coffee lover should try their delicious lattes and iced Rocket Fuel (cold-brewed coffee with chicory, maple syrup and milk). 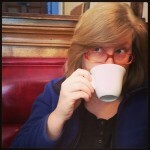 I remember those early days in the tiny, tiny space—which is still part of the current Jackson Avenue Sweetleaf, and houses the Laptop Room and bakery (some say Sweetleaf is really a bakery in the disguise of a coffee shop). You can read more about their history and learn a little bit about what makes them so special and important in the world of NYC coffee. Rich also tell us that we can expect to have the usual Sweeteaf coffee and pastry experience (yum, get me three cinnamon puffs, STAT). They may add beer and wine at a later time but that is still undetermined. As for the space, Rich teases out this about a surprise for the new location that is still in the planning stages: “I’m very confident that it will make this Sweetleaf a must-see in LIC. People will want to travel to LIC from far and wide just to see our space.” They can’t reveal the details yet, but we look forward to seeing the big reveal. On top of that, the location is excellent—right next to one of the Queens Plaza entrances. Talk about a great cup of coffee on your commute. As for Jackson Park, apartments in the building are now up on StreetEasy, in case you’re curious. Rents range from $1850 (studio) to $7385 (4 bedrooms). Amenities include “indoor/outdoor fireside lounge, demo kitchen, private dining room, gaming rooms, golf simulator, state-of-the-art fitness center with group fitness studio, a 75’ indoor lap pool, massage treatment rooms, steam and sauna room, full-size basketball court, squash court, outdoor pool, and hot tub.” And then there’s the “rarest of New York amenities”: “your very own private 1.6-acre park, featuring a great lawn, dog park, children’s play area, bocce court, BBQ’s and more.” Plus, Sweetleaf on the ground floor!